Since our founding more than 50 years ago, Club Car has become the world’s largest manufacturer of small four-wheel electric vehicles. Our extensive portfolio includes electric, gasoline and diesel-powered utility and turf utility vehicles as well as golf cars, low-speed vehicles and transport vehicles. Renowned for their durability and versatility, Club Car vehicles are designed specifically to meet our customer needs and solve their problems. They are engineered with exclusive features that improve durability, versatility and reliability. The vehicles are backed by industry-leading warranties and a network of more than 600 Authorized Club Car Dealers who staff factory-trained technicians and stock genuine Club Car parts. We also offer complimentary fleet planning services by trained experts, the industry’s largest portfolio of commercial and industrial accessories and a variety of leasing options. Club Car products are made by American employees in a 400,000-square-foot manufacturing facility in Augusta, Ga. The company is a division of Ingersoll Rand, a $14-billion global business whose brands also include Thermo King®and Trane®. Our diverse portfolio includes more than 50 models and configurations of vehicles designed to meet your work, transport and golf needs. Gas, diesel and electric power. Two- and automatic four-wheel drive. Light- medium- and heavy-duty models, that can do the work of pickup trucks and have a maximum carrying capacity of almost a ton. Four-passenger models with extended beds that carry two crews and their gear. We also offer heavy-duty Transporter transport vehicles that carry two to six passengers as well as more refined Villager transport vehicles that seat two to eight in comfort and style. Our Precedent® golf cars are the backbone of many prestigious golf clubs, as well as many city, county and state courses. Our Carryall turf utility vehicles and Café Express mobile-merchandising units improve golf course operations. Our zero-emissions low speed vehicles (LSVs) are legal on roads with speed limits of 35 mph or less in almost all states. These include Villager LSVs designed primarily for transportation as well as work-ready Carryall LSVs that deliver the power and versatility of pickup trucks. Each arrives configured with the equipment needed for a specific application, based on an analysis of buying patterns for work utility vehicles used for that job. This vehicle’s narrow profile and tight turning radius make it ideal for security applications. Available in gasoline and electric models, it features a complete cab with windshield and wiper, glass doors, rear window, seat belts, an amber light bar with alley lights and more. This vehicle’s tight turning radius lets it snake though narrow paths and speed emergency response. Available in gasoline or electric models, it comes with a medical-attendant seat, locking storage box, deck-mounted toolbox and hand-carry stretcher. This tried-and-proven ambulance carries three, including a medical attendant, and features a hand-carry stretcher and mounts, fold-down rail, storage boxes and more. It’s available in gasoline and electric models, both of which accommodate a full-size ambulance stretcher and Stryker lift. This four-wheel drive ambulance covers wet, hilly and rough terrain. Its IntelliTrak™ automatic four-wheel drive system senses the ground it’s on and shifts as needed. There’s also a medical-attendant seat, locking storage box, stretcher and more. Available in gasoline or diesel models that accommodate a full-size ambulance stretcher and Stryker lift. This vehicle lets your maintenance crews move quickly from job to job. It features dual-locking tool boxes, a dual ladder rack with tie downs, a heavy-duty two-inch receiver and much more. This vehicle features a long aluminum cargo box with a stake side kit mounted on top. The bed accommodates holders that carry tools and equipment outside the bed, freeing bed space and reducing round trips. There’s also a hose reel with electric rewind, heavy-duty receiver and much more. Comes in gasoline or electric. This affordable vehicle lets you organize and move food across your property. Its lockable white room service van box is powder coated inside and out and equipped with tray shelves and a food warmer box. This larger vehicle gives your crews everything they need to move food across your property and generate additional revenue. Its extended bed carries a van box system with a 68-tray rack, a 10-shelf rack and more. This vehicle’s L-shaped van box carries a full-size vacuum cleaner, brooms, mops and more. Shelves hold linens, towel and supplies. Drawers carry soap, shampoo and other small items. This vehicle’s larger L-shaped van box with interior LED lights also carries a full-size vacuum cleaner, towels, linens, cleaning supplies and more. 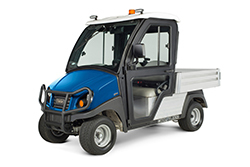 This vehicle speeds trash collection with a waste hauler, heavy-duty electric bed lift, two-inch receiver and more. It’s available in gasoline or electric models. This vehicle features a high-dump hopper, sturdy plastic waste hauler for above-ground dumpsters and an electric bed lift with a hydraulic actuator that lets your crews empty trash directly into a dumpster. The cab is engineered to improve comfort and reduce the risk of heat-related accidents with a tilt-out windshield, spacious sliding windows in the doors, and a large flip-out rear window. Rustproof corrosion-resistant aircraft-grade aluminum frames designed to resist impact better than steel frames. Competitive vehicles are made on steel frames that tend to rust. Gasoline vehicles with best-in-class single-cylinder overhead cam engines with electronic fuel injection and hemispherical heads. IntelliTrak™ automatic all-wheel drive systems on 4x4 utility vehicles. The system senses the ground it’s on and shifts as needed. Excel™ and IQ Plus™ electric drive systems that allow electric vehicles to perform tasks that once required the power of a gasoline engine. Smart, global chargers on our electric vehicles that boost efficiency, reduce charging errors and can be programed for various types of batteries. Resilient ArmorFlex bodies with molded-in color that resists scratches. No painting required. SportDrive™ steering and suspension system for more automotive performance. IntelliTach™ fully hydraulic tool attachment system for 4x4 utility vehicles. Regenerative braking that increases range and improves the safe operation of electric vehicles. 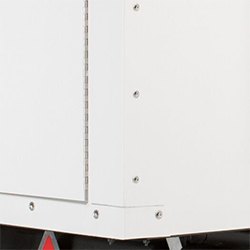 Single-point watering systems that simplify battery maintenance. Fleet planning services by trained transportation experts. The industry’s widest range of commercial/industrial accessories. Strong warranty coverage backed by Club Car, a name you know and trust. A nationwide dealer network with easy access to parts and service. Club Car launched a Transportation Solutions Program to help identify and solve your transportation problems. As part of this program, the company invested in training Transportation Solutions Experts who understand the fleet needs of campuses and other government sites. These professionals work with you to audit your existing fleet -- department by department and vehicle by vehicle -- and help you create a Comprehensive Transportation Strategy for your site. 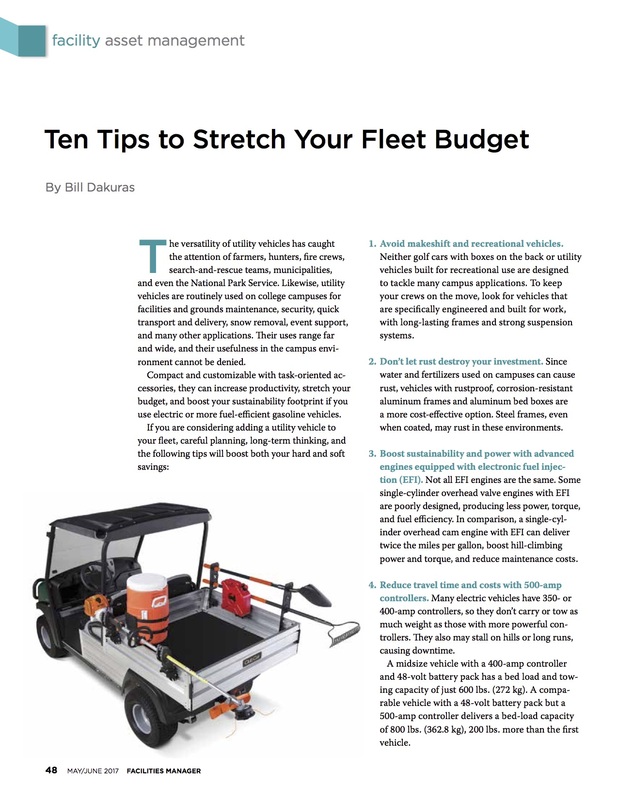 The strategy lets you do more with less, avoid common fleet problems and address many safety issues upfront and fleet-wide. How do I place an order with Club Car? You must be a registered participant to utilize the Club Car contract. If you are not, please register now. Our vehicles are sold through Authorized Club Car Dealers and Distributors, not through our corporate office. To find a dealer or distributor near you, visit www.clubcardealer.com and contact the dealer directly. The dealer will arrange an on-site demonstration, discuss accessories, provide pricing, arrange shipping and act as a liaison if you need customized vehicles or other special services. If you need additional support, please contact Club Car directly at uscommunities@clubcar.com or 706-955-0252. 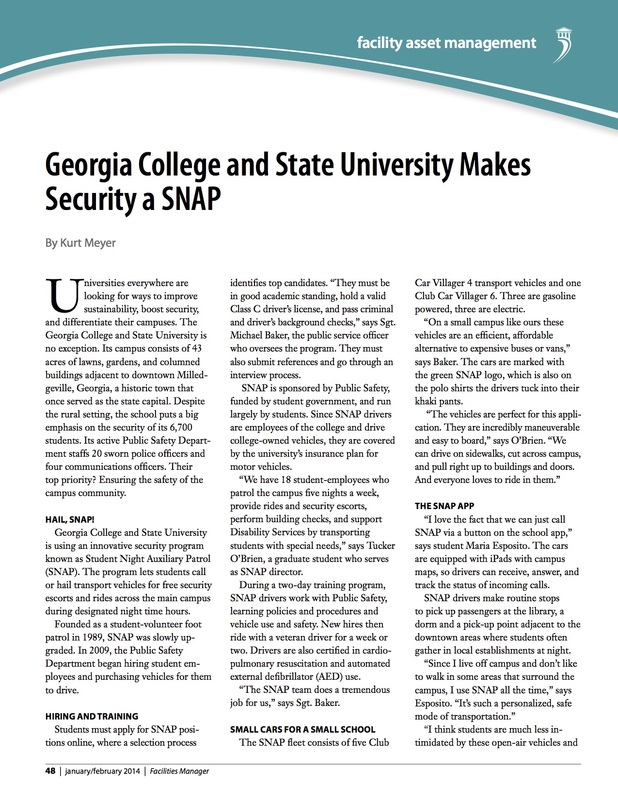 States, state agencies, counties, cities, schools, colleges, universities, non-profits and special districts. Yes. Various types of leasing options are available. Yes. Your Club Car Dealer or Distributor offers maintenance contracts and service by factory-trained technicians.